Don’t worry about renting a kilt from home and bringing it with you! Let Lothian Kilt Rentals reduce your stress by providing your rental outfit(s). Most European countries hire outfits on a per-day cost basis. At Lothian Kilt Rentals, we have one fee for your entire event. Whether you need your kilt for 2 days, 3 days, or 5 days, our single flat rate covers your entire outfit (head to toe) for the entire event. We guarantee that it will be more cost effective to rent your highland wear from Lothian Kilt Rentals instead of bringing a rental outfit from home. You won’t need to sacrifice on quality either. All of our outfits are 100% made in Scotland. Our kilts are made from 8 yard, 16oz heavy weight cloth and travel very well. 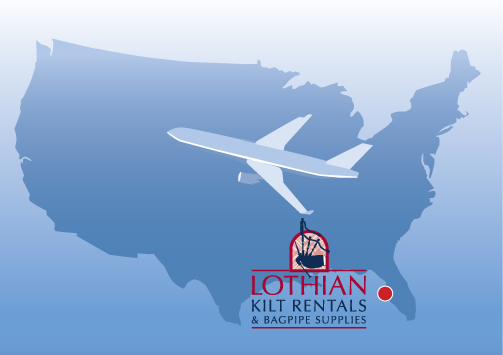 Lothian Kilt Rentals will ship your outfit to any of the US lower 48 states (excludes Hawaii and Alaska). Simply visit our How to Rent page or send us an enquiry to get your rental started. Copyright 2013 Lothian Kilt Rentals. All rights reserved.